UnSit customers find the Luna Stool to be a great solution for an occasional sitting break. The Luna Stool is a mono-pole you can perch on. You can also use a stability ball or a stool or even a chair. We do not recommend using a chair with wheels for safety reasons, but you can, it will not damage the treadmill's belt. Is the Walk-1 Treadmill too short? No. Contrary to what our competitors say, you do not need a long runway of treadmill behind you because the WALK-1 treadmill can only go 2mph, thus your stride length is very short. (Other treadmills can go faster thus they must provide a longer runway behind you). If you did walk near the back of a long treadmill you could not reach your desk. With over 300 WALK-1 Treadmills in use, no one has ever complained of feeling the back roller and they all appreciate the space they save behind their desk. We even have some famous basketball players walking on the UnSit WALK-1 and loving it. Is 2 mph really fast enough? Yes. 2mph is plenty fast. Before we produced the WALK-1 we gathered data in a year long beta trial. The average person walks at only 8/10ths mph, (less than 1mph). Walking much faster than 2mph would make it very difficult to perform tasks at your desk. If you want to walk faster than 2mph you really need a fitness treadmill and you need to be dressed for exercise. Remember, Treadmill Desks are NOT for vigorous exercise, they are to replace your chair. How loud is the treadmill? Not loud at all. In fact, it is very quiet. We measured the decibel level at 42.9dB at ear level with the treadmill going 2mph in a quiet room with hard floors. (Most people use the treadmill at only 1mph. Decibel level readings vary depending on the acoustics of the room. If you're on a hard surface floor (tile or hardwood) it will sound a bit louder. On a soft floor such as a padded carpet you'll hardly hear it. If you're in a pitch quiet recording studio you'll hear it. In a normal office environment you won't notice it, BUT you might hear the sound of shoes clomping, depending on how hard people walk. How easy is the Walk-1 Treadmill to move? 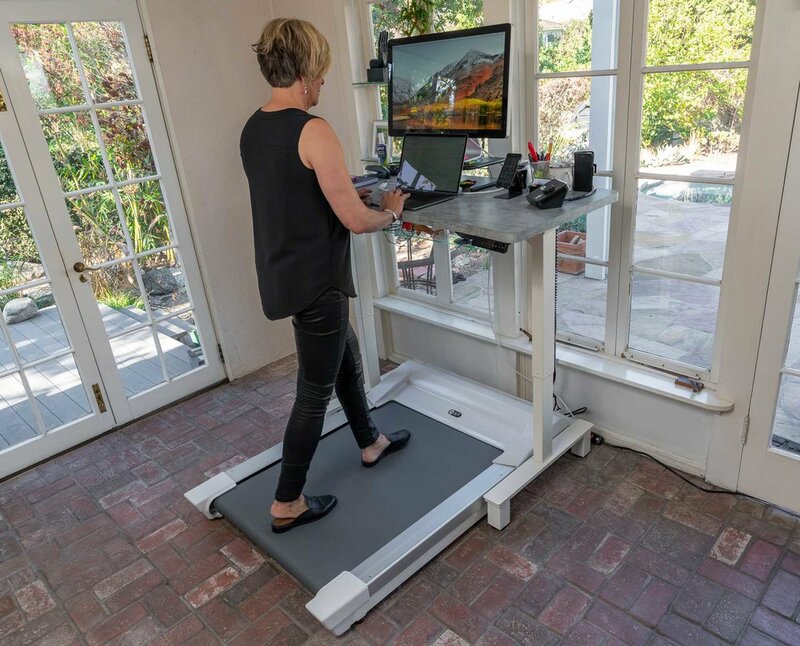 The WALK-1 TREADMILL has specially designed wheels that carry most of the weight of the treadmill and engage immediately when you lift from the rear making it the easiest treadmill desk platform to maneuver. It is not practical to move the treamdill frequently. If you want to move it out of the way so you can use a chair, take a look at the FAQ above, "Where will I sit?" I already have a stand up desk. Will the UnSit treadmill fit? The UnSit WALK-1 TREADMILL is designed to fit under the most common Stand-Up Desks. The WALK-1 is 39" wide so make sure you have at least 40" of space BETWEEN the two upright legs of your desk and that there are crossbars below one foot off the floor. How long can I use the Walk-1 Treadmill desk per day? The WALK-1 TREADMILL DESK is designed for commercial use, and therefore can be used all day. As for your body, if you have no inhibiting orthopedic problems and are in good health then you can quickly work up to walking all day. Many UnSitters walk over 5 miles per day. Who will service the treadmill? UnSIt has a network of independent treadmill technicians across the United States. We are partnered with and operate from National Gym Supply in Los Angeles and have relationships with treadmill technicians who have had factory training from major manufacturers of treadmills and fitness equipment. We can dispatch a treadmill technician in most major metropolitan areas. In addition, we can support a non-treadmill technician such as an electrician or mechanic with parts and phone support, so they can service your treadmill. Yes, UnSit under desk treadmills come with the following warranties, valid in the United States and Canada only. More info about the UnSit warranty can be found here. UnSit was founded in 2015 by industry pioneers Paul Byrne and Rob Jacobs. Read the whole story here on our About Us page. How does the UnSit Walk-1 compare to other treadmill desks? Does the Walk-1 Treadmill stop when I get off? Is the Walk-1 Treadmill easy to restart if I step off? If you step off to take a break simply press the controller wheel when you get back on to resume at the same speed. What does the UnSit App do? The App tracks steps, distance, time, calories, standing time and Total UnSit Time, which is the total time you walked and/or stood on the WALK-1 TREADMILL. The App automatically sends its data to Apple Health and/or to your Fitbit account and to our web app where an accumulation of all steps taken by UnSit users is displayed on top of our website. Simply download the UnSit App from the Apple App Store or Google Play , place your smartphone on your desk, launch the App and tap the "connect" button (Make sure your phone's Bluetooth is on). If I do not have a stand up desk what are my options? You can purchase the WALK-1 TREADMILL DESK which includes both a height adjustable standing desk and the WALK-1 treadmill. Go to the UnSit Shop page for details about our DESK-1 and other desks options. The step count and distance covered on the UnSit App doesn't agree with my Fitbit or Apple health app. The UnSit App is most accurate because FitBit and Apple Health just estimate steps using the accelerometer in their device to sense the swing your arm. From that step count they estimate distance covered assuming you covered about 2.3 feet per step. However the UnSit App receives exact data from the treadmill. The treadmill senses each foot strike and transmits each step to the App. The treadmill accurately measures distance the belt has moved and transmits the distance separately to the App. NOTE: When walking on a treadmill desk, people tend to walk MUCH SLOWER than a person outside striding for exercise. Outdoors, people tend to walk about 3 mph and so the estimate of 2.3 feet per step is true. But on a treadmill desk people tend to walk at about 1 mph thus the distance they cover per step is probably about half that of someone walking fast outdoors and therefore the discrepancy in data shown on your FitBit or Apple Health App. How are UnSit products shipped? The WALK-1 Under Desk Treadmill and Treadmill Desk ship on a pallet via motor freight (they are too big to ship with UPS or FedEx). We handle and ship the treadmills from our warehouse in Los Angeles California. The DESK-1 alone can ship with FedEx. You will need to make an appointment with the freight carrier for delivery and have adequate help to move it in to your home or office. Click here for more information about shipping. UnSit can arrange for White Glove installation service where a qualified service provider will deliver and install your Treadmill Desk. INSIDE DELIVERY - The Carrier will call and schedule a time window and the driver will move the boxes inside your home or office building but they may not move it into a specific room. If you are in a commercial office building the driver is only obligated to bring the treadmill inside "the first threshold." From there, they may not bring it up any elevators or down long corridors.